Hemel Hempstead Town FC have announced the signings of five new players, while two more of last season’s squad have agreed new deals for next season. 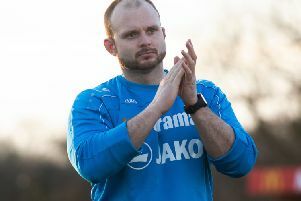 Tudors boss Dean Brennan has been busy in the market, bringing in Jamie Butler, Terrell Forbes, John Frendo, Ben Herd and Matthew Spring, while Kyle Connolly and Dennis Oli have agreed new contracts with the club. Butler is an England C representative goalkeeper who has signed from Concord Rangers following a highly impressive campaign for the Beachboys in the Conference South last season. Prolific striker Frendo signs from Hemel’s fierce rivals St Albans City, while Herd has signed from the Conference South promotion-winning Boreham Wood side – his former clubs include Shrewsbury Town (143 apps) and Aldershot Town (151 apps). Forbes is a central defender who has signed from Dulwich Hamlet; previously in his career he has played 114 times for Queens Park Rangers and 163 times for Yeovil Town. Central midfielder Spring has signed from St Neots Town – he has also played over 300 times in two spells at Luton Town and 45 times for Watford.